Well, a few weeks ago, I awoke with a start, realizing that graduation was once again just around the corner. And this time, I was 10,000 miles away. Despite all the hard work I put into the ceremony last year (printing the diplomas and getting the gowns made), I was certain that without some reminding, the school would likely completely forget about this occasion like they did before I came to Sri Lanka. So I quickly sent off an e-mail to David, asking him to remind Mr. Abeygunawardana about graduation. The gowns were inside a large pink plastic bag locked up in one of the gray cabinets in the principal’s office, a monk should probably be called to attend, I could print out diplomas, laminate them, and mail them to the school, and the parents should be notified well in advance so they can make the trip to Matara. Lo and behold, a week later, David responds with incredible news. Mr. Abeygunawardana and the school have already set everything up–the diplomas are ready; the parents have been notified; the gowns have been found. No foreigner’s finger was lifted in the making of this production. 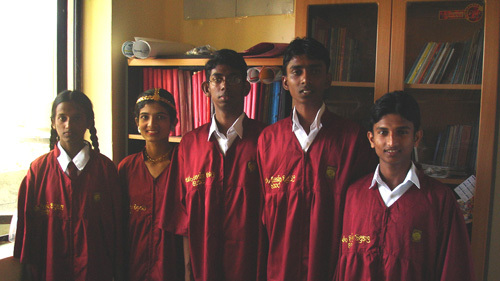 Sandya, Chamali, Pasan, Jeewaka Gayan, Sanjeewa. Sandya, Sanjeewa, Pasan, Mr. Abeygunawardana (Principal), Jeewaka Gayan, Chamali. These photos thrill me to no end because it’s the very first time I’ve seen anyone from the school since I left nearly six months ago. It’s so good to see their faces again. I’m a bit puzzled because Dilhani was supposed to graduate as well, but she’s not in the pictures. Hmm. Best of luck to the Class of 2007 on their O/L exams this week! 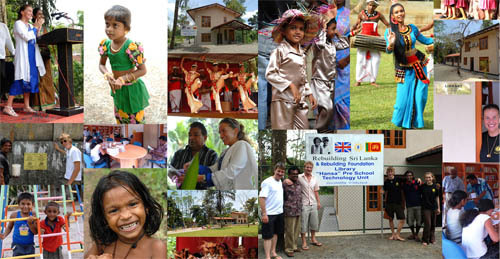 Life in Sri Lanka does go on, and things do keep improving, with or without the help of foreign volunteers. It’s a story that has repeated itself over countless times throughout history, and Rohana is no exception. Even today, I wonder if they’re buying replacement whiteboard marker pens for the classrooms or if they’ve just taken the easier, cheaper route and switched back to blackboards. Whether the new library card system is still working. Whether Lakmal is still working as a carpenter apprentice or not. Whether that women’s bag-making workshop still meets every week to manufacture purses to sell in the West. Which is why updates from Sri Lanka always delight me. It’s proof that there are still people helping out and that things are still pressing forth. on this month (September 23) we did celeberate our Deaf day at Uyanwattha Stadium. our All members ware come at there (295 members) and we all happy on that day. we will held on that day 3 programmes. its 1. blood Donation( wow..its hear to good news. 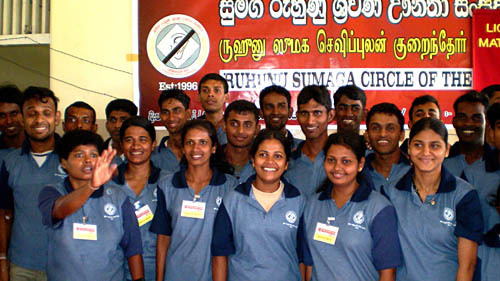 because this is first time blood donation programme in deaf persons in sri lanka. 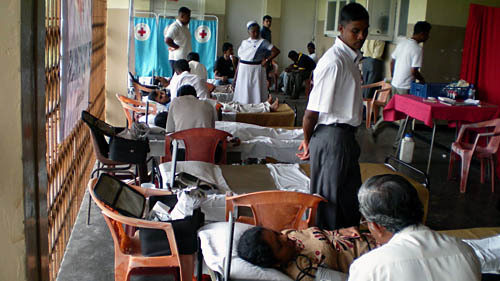 our 56 deaf persons did give thier blood.) 2. eye glass Donation( free give for more than 35 members) 3. travel for get donation to our deaf Association on sep 21 and 22. Also we create new t shirt for our deaf association. we start new bank for deaf persons Saving and getting loans its Name “SANASA”. 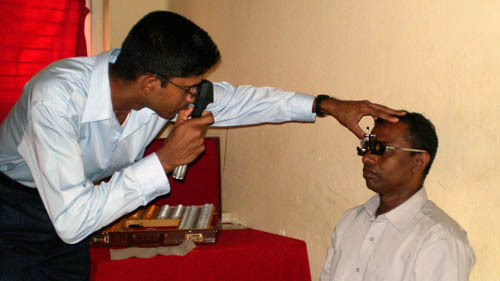 we think its more help to our deaf persons future life. A savings and loan bank for deaf people? A blood drive with deaf donors? All new things, and all wonderful signs of progress. New shirts for the members. In other news, last August the charity Rebuilding Sri Lanka (RSL) opened its new school, library, and IT center in Uragasmanhandiya, a poor rural area northeast of Ambalangoda. To date, this school has already nabbed 500 members for the library and and 150 children for English tuition classes. But RSL is dear to me because they have been the biggest supporters of Anoja Weerasinghe’s dance troupe. Anoja is one of Sri Lanka’s most famous film stars, and routinely puts on stage performances throughout Sri Lanka. Last October, we watched her group put on Mother Courage, performed in Sinhala! In creative collaboration with Wolfgang Stange of AMICI Dance Theatre Company in London, Anoja has been working for two and a half years with Rohana Special School’s deaf and disabled children, planning and rehearsing a new dance performance: Memories of a Monkey Boy. Based on several grassroots stories about the 2004 tsunami, the cast includes both Anoja’s professional dancers and Rohana’s children. 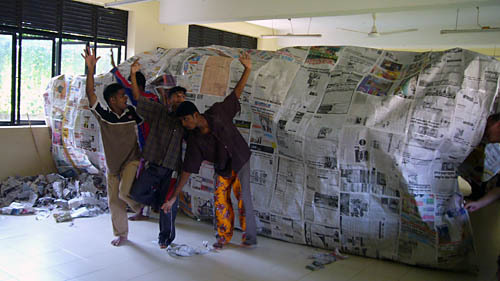 While I was in Sri Lanka, Anoja’s group came three times for multiple-day rehearsals in Rohana’s main hall. All day, parents and children would peer from outside through the main hall’s windows enraptured by the music, the dancing, the star power, and the talent. For many deaf and disabled Rohana pupils who were chosen to be part of the final cast for Monkey Boy, it’s been a tremendous source of self-worth as they realize they have just as much skill and stage presence as any other dancer. A scene from Monkey Boy. Sanjeewa has fun in the congo line. [Last September,] the cast of deaf and differently abled children put on an astonishing show leading to standing ovations from the packed auditorium every single night!! Two of the actors have since been offered acting parts on TV and film. RSL have been actively involved in supporting this school and their production since March 2005 so it was very moving for us to see these children shine so brightly and to be given opportunities which had previously been an impossible dream. There’s now the possibility that Monkey Boy might have a showing in London next June. That’s right. Some of my kids at Rohana might be going to the United Kingdom!! We’ll need to raise money first so you’ll definitely be hearing about this again shortly! So there you have it. Two updates–and proof that life goes on in Sri Lanka and that people are still helping make wonderful things happen. Thanks to Marilyn (you may have noticed her frequent comments on this blog while I was in Matara), I gave a presentation this afternoon to the ASL I and III classes at San Dieguito Academy. I’m always happy to help out my home secondary school district whenever I can, but this was a nice start to realizing one of my Ceylonese ambitions: giving presentations about Sri Lanka. Instead of using Powerpoint, I created my presentation in Keynote, an awesome product from Apple. The effects there are just so snazzy, and the themes are so clean-looking. I’ve uploaded a HTML version, which doesn’t do the original format justice at all, but you’ll see what topics I touched on during my presentation. The projector in the media center was UFO-sized, and the picture was gignormous. It must’ve been at least 15 feet high (plus five feet off the ground). It was really fun to have this huge screen to play with. I showed them the video and some photographs (both which are not available in the online version of the presentation), and the students seemed to really enjoy them. I was really impressed with many of their questions. For example, one student asked if Sri Lankan Sign Language (SLSL) had a different syntax than ASL, and another one inquired whether SLSL had dominant-hand signs. I explained the unique Sinhala fingerspelling system and they seemed to totally get it. They asked about food, cricket, and the challenges of putting deaf, blind, and learning-challenged children in the same school. I was floored when one girl told me she had watched the 2007 ICC Cricket World Cup. And true to southern California form, one boy asked if Sri Lanka had any good surfing spots. I had a hour and half, and pulled it off with beautiful timing. There was about 10 minutes after my last slide, which was a perfect amount of time to answer any last questions before the let’s-pack-up-three-minutes-before-the-closing-bell phase began. I made handouts too detailing the BSL fingerspelling alphabet, the Sinhala fingerspelling alphabet, 18 basic SLSL signs, and the web addresses of both this site and Rohana Special School. I really couldn’t be more pleased with how it went! I gave proper attention to each topic without delving into the esoteric, kept it light and fresh, and engaged the students in practicing sign for the last half-hour. Kudos to Kathryn Friedrichs, the lead ASL teacher, for voicing me the entire time, and doing a marvelous job of it!